Karen was a music lover, dancer, and aspiring drummer. Her amazing sense of rhythm never quite translated to a drum kit, but it certainly did on the dance floor - and every flat surface was a dance floor to her. Music was an important part of her life, and there were a few albums she loved. Two, by Lavern Baker, were in constant rotation in the house and car. When she needed a pick up, she invariably turned to Bette Midler Sings The Rosemary Clooney Songbook, and played (and replayed) A Slow Boat To China. During Christmas she had Christmas music playing around the clock. Her favorite song, however, was Amazing Grace. Karen's favorite albums are here for your listening pleasure. Hearing the music she loved will give a glimpse into what she enjoyed musically - and music was a necessity for Karen. She developed a great appreciation for jazz and blues, although her musical tastes were certainly not limited to those. 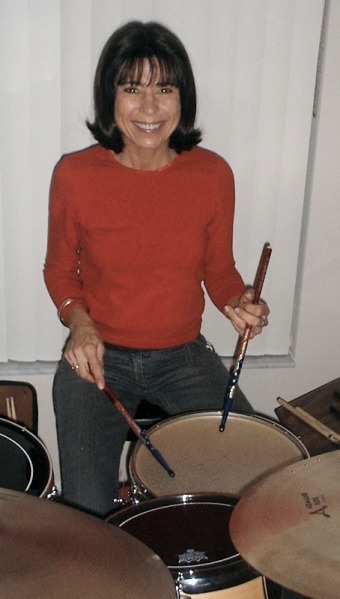 After watching countless drum videos of legendary jazz drummers she picked up - probably through osmosis - a vast knowledge of styles unique to some of the greats such as Gene Krupa, Papa Jo Jones and Joe Morello. In fact, she could identify who played drums on many recordings based on their styles. But it was Lavern Baker's music that captivated her. There was only a single style that she didn't particularly care for (but put up with): Ragtime and stride piano.